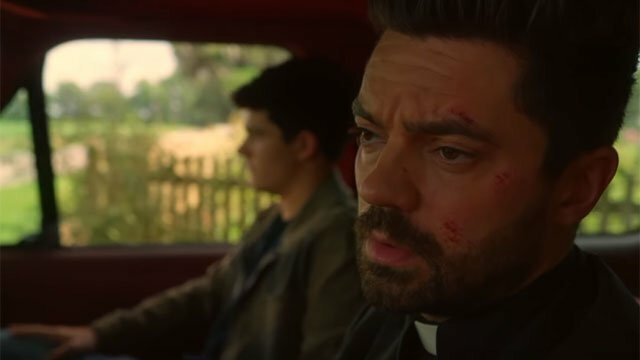 It’s the end of the road for Preacher‘s third season, and possibly the series as well. To be honest, the ratings have not been great compared to the previous two seasons. 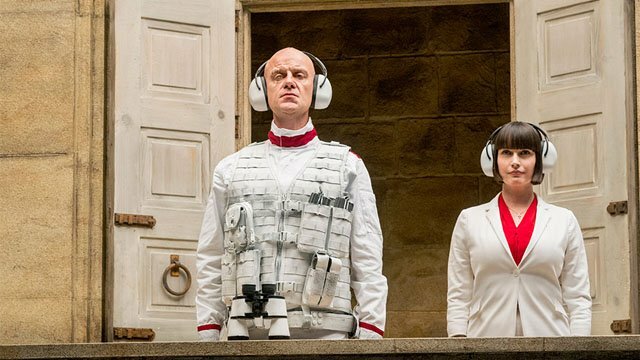 So don’t be too shocked if AMC pulls the plug before this show wraps up its story. Hopefully, the creative team will get a chance to finish what they started. Last week’s episode restored Jesse’s soul and reignited his connection with Genesis. 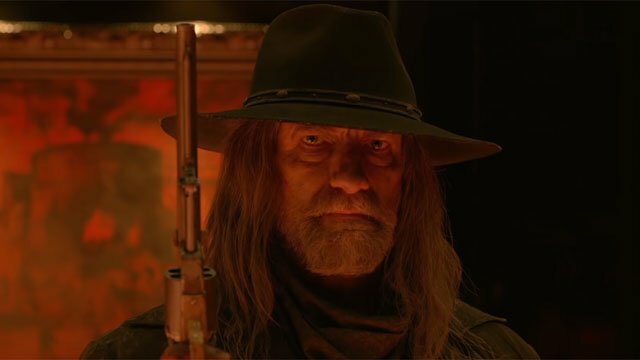 As Jesse went off to kill his grandmother, Tulip was stuck on a bus to Hell with Hitler, Eugene, the Angel of Death, and the Saint of Killers. After the bus crash, Tulip found herself in the middle of a one-sided fight between Hitler’s modern Nazis against the Saint and the Angel/Sydney. Tulip took out a few Nazis herself while Eugene wrestled with Hitler and prevented his escape. But just when the Nazi tank fired a shot at the bus, God froze time and reappeared to Tulip. Once again, the almighty declared himself to be a loving God. However, God’s intervention had a price. He told Tulip to convince Jesse to stop looking for him. When she refused, God hinted that Cassidy was in mortal danger. When time resumed, the Saint dispatched the last Nazi before blinding Sydney for making a crack about his daughter’s fate. Then the Saint brought Hitler, Eugene, and Sydney back to Hell. Eccarius’ followers seemed to be upset about Cassidy’s impending demise. Eccarius took that as an opportunity to once again appeal to Cassidy and convince him to rejoin the fold. Cassidy agreed, and he was even up for simultaneously turning Mrs. Rosen with Eccarius. But in a swerve, Cassidy had already turned Mrs. Rosen. They bound Eccarius and revealed that they knew he had killed almost everyone else who had been turned. Mrs. Rosen turned the rest of the cult and they fed on Eccarius as he had preyed upon their friends. Shortly thereafter, Cassidy was moved when Tulip called to check in on him. But before she could arrive, Hoover returned and seemingly embraced the vampire lifestyle. It was a short lived lie, as the Grail massacred the vampires and kidnapped Cassidy. Only Mrs. Rosen and her son survived to tell Tulip what happened. Cassidy awoke at a remote Grail fortress, with an angel held captive above him. Herr Starr killed Hoover once he realized he was a vampire, and declared his intent to annihilate Jesse. Deep within the bowls of Hell, the Saint personally delivered Eugene and Hitler to Satan. True to his word, Satan returned the Saint’s deadly weapons. The Lord of Darkness even bragged about the synergy of the Saint’s plan to murder Jesse. He explained that upon Jesse’s death, his soul and Genesis would be sent to Hell. But the Saint wasn’t interested in that. Instead, he pulled his gun on Satan and got him to admit his role in the horrific fate of his family. Satan put the blame on God, but that didn’t stop the Saint from killing him. In a rare moment of compassion, the Saint allowed Eugene to leave Hell alongside him. Eugene even vowed revenge on Jesse for sending him to Hell in the first place. The Saint didn’t allow Hitler to join them, but he found a new gig in Hell as Satan’s replacement. Jesse had a vision of his younger self as he returned to Angelville to finish off Gran’ma L’Angelle. First, Jesse had a brutal fight with Jody in the tombs and avenged his father’s death. Jesse intended to spare TC’s life, but TC convinced him to let him die with Jody. As for Gran’ma, Jesse used Genesis to free himself and Tulip from their obligations to her. However, Gran’ma revealed that her new deal with Satan would send Jesse to Hell if he ever killed her. Incensed, Jesse ordered Gran’ma to destroy the souls that would have sustained her. Although Jesse tried to leave it at that, his younger self reminded him that he couldn’t let his vengeance wait any longer. Jesse returned to the house and hooked up Gran’ma to her own soul sucking machine before burning it all down. Finally, Jesse reunited with Tulip as they once again hit the road. 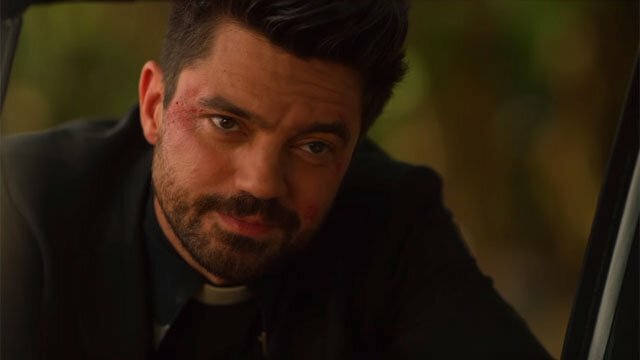 What did you think about Preacher season 3 episode 10? Let us know in the comment section below! 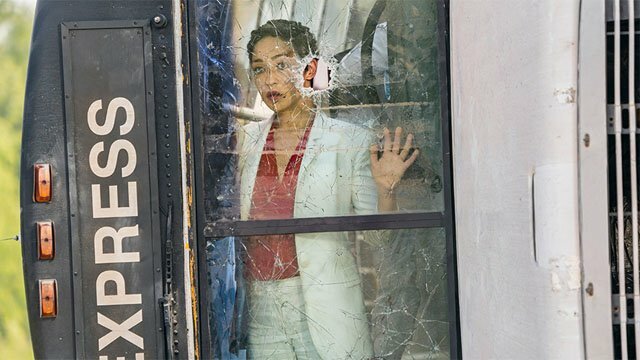 The post Preacher Season 3 Episode 10 Recap appeared first on ComingSoon.net.